How Not To Design A Qwerty Keyboard For A Console | OhGizmo! There was something elegant about the recently announced Xbox 360 qwerty thumbboard. 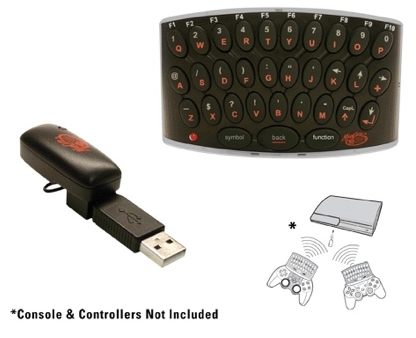 Not so with the PS3 Wireless ThumbPadâ„¢ from Madcatz. Dude, they put the friggin’ thing on top! This is presumably because it needs line of sight with the included dongle (we’re getting this from the dandy picture you see above), but how hard could it have been to make this work on RF? Sure, it’s only $30, and you’ll be able to chat with your friends. But whatever, we’d pay $30 just to not have that monstrosity in the room with us. But, well, to each his own, right? Seems to be available now. Hello, just wanted to introduce myself. I’m new on this board and I hope to make new contacts. I’m 22, from Spain. And my main hobby is to travel all around the world! NOTE: thats from the instruction manual…its not line of sight but RF. This can be found on madcatz website.